Gary Moulds and Steve Kirwan. Gary Moulds along with English passenger Steve Kirwin will take on the best in the world at the 2019 Sidecarcross World Championships. The plans to become the first Irish sidecar driver to attempt a full GP season were finalised last week and to say the 23-year-old was excited about the prospect of tackling such an enormous challenge would be an understatement. It has been an astonishing rise to the top of the sport for Moulds who only started racing in 2011. Seven years later he is heading into his first full GP season. It was a happy Gary who chatted about his expectations for the forthcoming 2019 season and looked back on his rise to the top of his chosen sport. “The governing body of the sport the MRA had to change the rules to allow me to start racing as I was too young. I began on a 250cc machine before moving onto a 450 but it wasn’t until 2016 that I finally got a competitive 665cc engine and began challenging the more experienced riders,” he said. Moulds and Kirwin had a sensational 2018 season winning both the Ulster and Irish championships, finishing as the runners-up in the British and on the world stage scoring points in the final two GPs of the season in Switzerland and France. 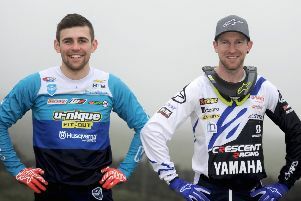 With nothing to prove on the domestic scene it comes as no surprise that the pair have decided to step it up a level to the world stage next year. It has not been an easy decision as it will take a massive financial commitment not to mention time away from home as the 14 round series will take them the length and breadth of Europe, but it is a dream that Gary has chased throughout his short career and one that the talented Ulsterman cannot wait to get started. It may be a new adventure for Gary but Steve will take it all in his stride having competed in over 100 GPs since 2006. “2018 was special. To win both domestic titles and come close in the British was great but to finish eighth in the French GP after a 15th in Switzerland was unbelievable: some debut!” recalled Gary. “Going to my first GP was the realisation of a lifelong dream and I have to thank the GrayDawesGroup as without their help I would never have made the trip. It was a crazy year in many ways. On the GP front Gary became the youngest Ulster rider to score world championship points and I wondered what the experience was like to line up against the best in the world? “It was a surreal experience. I qualified ahead of ten times world champion Daniel Willemsen in France and to line up beside him at the start gate was unreal. “ It was like a dream come true. I think our results over the two GPs exceeded everyone expectations. “It’s going to be a busy season as every weekend there is no GP we will be back home for the British Championship. We honestly don’t know how it is going to work out. Gary is also taking confidence from having such an experienced passenger on board. “When I race with Steve it does give me confidence. I have my job to do and Steve has his. In my mind we are the prefect team,” he said. The other half of this dream team is Steve Kirwin, a seasoned campaigner in sidecarcross. The 34-year-old from just outside London teamed up with Gary back in 2016 at the last round of the British championship at Canada Heights. They finished fifth on the day, a season best for Gary. He said: “A chat over the 2016 winter formed the partnership as it is today. We came out in 2017 and won the first round at Desertmartin. “After 21 years as a passenger you could say that I have a bit of experience. “I told him when I first met him that he was a top-three British championship rider and he listened and that’s where he is at the minute. He’s got the pace to win the British and that’s where the GPs will benefit him.